EQUIFAX HACKED! YAHOO HACKED! WHO IS NEXT? YOUR IDENTITY IS AT RISK! It is time to get active protecting your personal data. Get your personal SafeZone Pass today for maximum privacy and for maximum security. 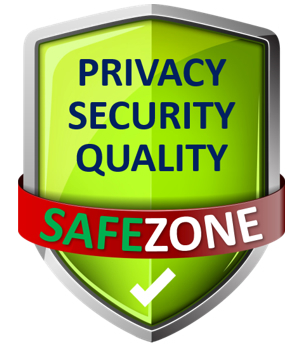 The SafeZone is a fast-growing network of websites which is setting new privacy, security, and quality standards on the Internet. Your SafeZone Pass includes a unique PerNum, a personal number that protects your privacy. Instead of sharing your name, your email address, your phone number, or even your credit card details, you simply share your PerNum, while your personal data is safe on our military-grade encrypted and protected SafeZone servers. Now, when you for example subscribe for a newsletter, instead of your email address, you enter your PerNum. The website delivers the newsletter through our servers without knowing who you are. Within the SafeZone, all websites are secured by SSL encryption for your safety. On top of that, each website is scanned on a daily basis for any hacking attempts or possible malware threats. Whenever you open a page in the SafeZone, you can rest assured that you are protected. As a SafeZone member, your data is protected by 2-step authentication. Besides your password you need a 3-digit one-time PIN each time you are logging in to the SafeZone. This one-time PIN is randomly generated from a Master PIN that only you know. Thus, no hacker can enter your account. In the SafeZone, we bring prize draws to the next quality level. You can win for free, you can win without sharing your data, and you can win big! All prizes are guaranteed, from smartphones to cash jackpots. You can even win the biggest international lotteries for free. Your SafeZone Pass is at the same time your global-local bonus card. No matter if online or at local retail stores, restaurants and service providers, whenever you see the Perfect Bonus logo, you are qualified to receive exclusive special offers, coupons, and discounts. As a SafeZone member, you are automatically qualified to receive valuable rewards for your online activity, as well as cash commissions and bonuses for inviting other users to join the SafeZone. Thus, you can build a passive residual income with literally no effort. The Rainbow Currency is the exclusive digital currency for the SafeZone. It is backed by company shares, strictly limited, and irrevocably connected to our strong SafeZone economy. Pay for products and services with maximum privacy and security. Twice per week, we are broadcasting live from our SafeZone Studio in Reno, Nevada, sharing with you the newest updates from the SafeZone. We share tips, information, and exciting updates. We have a weekly prize draw and so much more during the SafeZone Radio Show. Be sure to tune in every week to learn more and join in the fun in the SafeZone!